Born in Stoten, Wisconsin in 1894, Silas Edward Nelsen attended high school in Portland, Oregon. With no formal architectural training, reportedly he walked into the offices of Heath, Gove and Bell (one of the premier architecture firms in Tacoma) in 1915 to obtain a job as an architect. A quick study, after approximately five years, Nelsen opened up his own architectural practice in Tacoma. In 1924 he was granted an architectural license and commissions soon followed. His first known project was a Tudor style dwelling at 2420 N. Union Avenue in Tacoma. During the late 1920s and throughout the 1930s, Nelsen’s designs followed the popular early twentieth century period revival styles such as Tudor Revival and Colonial Revival. While his projects were mainly residential commissions he also designed several libraries, churches, and downtown businesses during this time. Several of his residential projects were featured in a variety of national magazines and plan books. Better Homes & Gardens’ Five Star Plan book, published from 1935-1946, featured five of Nelsen’s designs. By the 1930s and 1940s, Nelsen’s projects became increasingly more Modern character. Many used the new concept of streamlining. Among his designs during this time was the remodeling of the Sears, Roebuck & Co. Store (1936), and designs for Fire Station No.2 and No.5 (1935) in Tacoma. After WWII, Nelsen’s designs continued in the Moderne vein with such projects as the Mueller-Harkins Buick Dealership (1948), the Temple Baptist Church (1949), and the Johnson Candy Company Building (1949). Nelsen’s projects during the 1950s included the Grace Moore and Fern Hill Branches of the Tacoma Public Library (1950), an International Style addition to the main Tacoma library (1952), the Tacoma City Light Administration Building (1953), and the Student Center (1959) and Collins Library (1952) at the University of Puget Sound. Nelsen also served as coordinating architect for several fraternity buildings on the campus (1961). 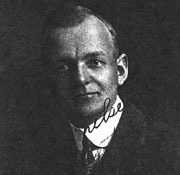 Nelsen had a long and prolific career as an architect in Tacoma. He designed over 150 residences, fifteen churches, and five libraries. He retired in 1971 at the age of 77 after a long career and passed away in Tacoma in 1987.